Desborough Town will be aiming to make progress in the ChromaSport & Trophies United Counties League Knockout Cup tonight (Tuesday). Ar Tarn take on Premier Division rivals Cogenhoe United in the first round at the Waterworks Field as they seek to build on the 2-1 league success over Sleaford Town at the weekend, which gave Chris Bradshaw a winning start after he was named as the club’s new permanent manager at the end of last week. Rothwell Corinthians and Wellingborough Town, meanwhile, are on the road in the Premier Division. Corinthians travel to Oadby Town as they look to bounce back from Saturday’s 2-0 loss at Wisbech Town. The Doughboys, who sit second from bottom, head to fifth-placed Newport Pagnell having suffered a 3-2 home defeat to high-flying Kirby Muxloe at the weekend. In UCL Division One, Whitworth will become the latest team to try to end Peterborough Sports’ 100 per cent start when they take on the leaders at London Road. 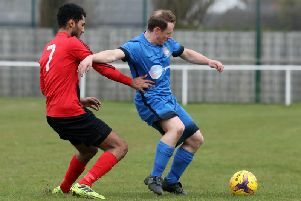 The Flourmen enjoyed a 4-0 victory over Potterspury in the second round of the NFA Junior Cup at the weekend.